One of the first visualizations on the web, the SmartMoney Map of the Market displayed live stock market data for more than a decade, starting in 1998. Night Live sketch in 2001. I designed the Map of the Market while at SmartMoney.com. The goal was to give a quick answer to the question, "what's happening in the market?" The Map of the Market quickly became one of the most trafficked sections of the site, and spawned many imitators. 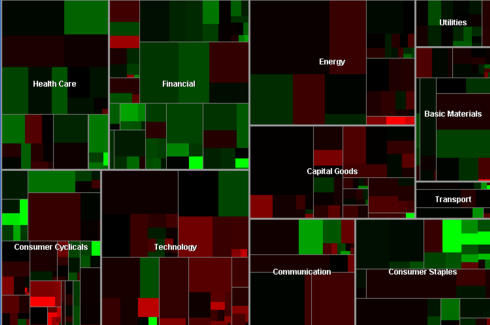 Today treemaps are a standard tool for visualizing financial data. At SmartMoney we created many variations of this map. 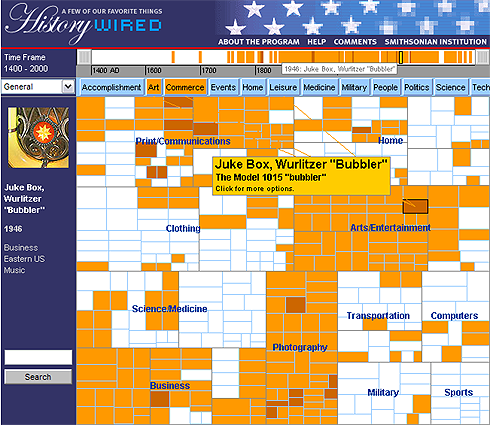 One of my favorites the site History Wired, a visualization of a selection of objects from the Smithsonian Museum. This was built in collaboration with Judy Gradwohl at the Smithsonian.